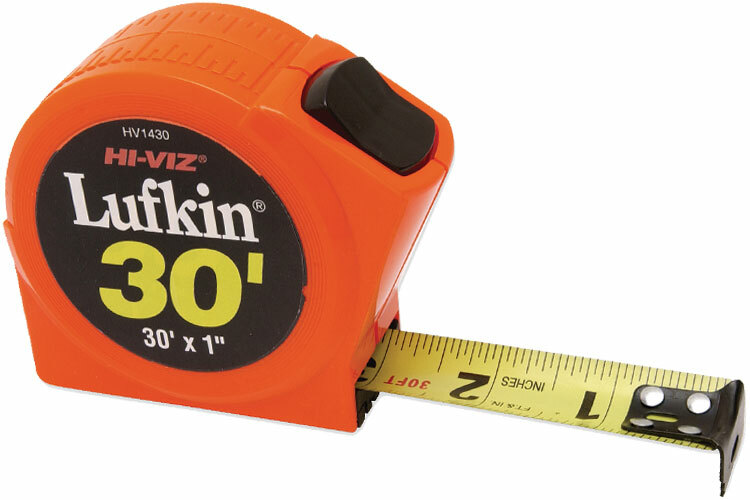 Each Lufkin series 1000 power return tape measure features a Hi-Viz case, which is easy to find on the job, lightweight and high strength and is designed to fit perfectly in the hand. Lufkin series 1000 power return tape measures Fit easily into most tape holsters and feature a bright yellow blade that has clear easy-to-read numerals. The Lufkin series 1000 power return tape measure toggle lock is positioned for convenient operation and holds the blade securely in any position. Lufkin series 1000 power return tape measures feature a cushioned blade return and have a removable belt clip. The PHV1038CME Lufkin Power Return Tape Measure is one of thousands of quality tooling products available from MRO Tools. Please browse Lufkin Series P1000 Power Return Tape Measures for tools similar to the PHV1038CME Lufkin Power Return Tape Measure. PHV1038CME Lufkin Power Return Tape Measure description summary: PHV1038CME Lufkin power return tape measure. Blade Size Width: 3/4'' Blade Size Length: 26'(8m) Blade Style: A30 Quantity discounts may be available for the PHV1038CME Lufkin Power Return Tape Measure. Please contact MRO Tools for details.